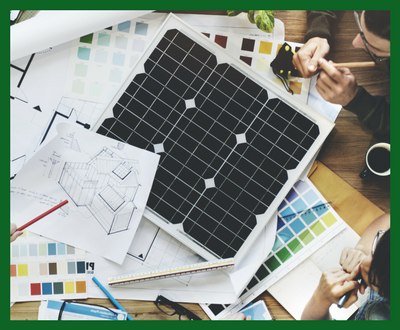 The solar energy works by capturing the energy of the sun and transforming it into electricity for your home or business. It releases small energy packages called photons, which travel about 93 million miles from the sun to Earth in about 8.5 minutes. Every hour, enough photons hit our planet to generate enough solar energy that theoretically meets global energy needs throughout the year. 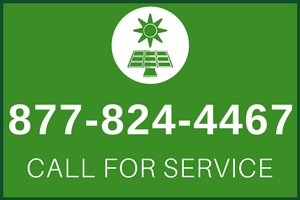 Currently, photovoltaic energy accounts for only one-tenth of a percent of energy consumption in the United States. But solar technology is improving, and the cost of solar energy is rapidly falling, so our ability to exploit the abundance of solar energy increases. When photons hit the solar cell, they release electrons from their atoms. If the conductors are connected to the positive and negative sides of the cell, it forms an electric circuit. When electrons circulate in this circuit, they generate electrical energy. Multiple cells form a solar panel, and multiple plates (modules) can be connected together to form a solar array. The more panels you can implement, the more energy you can generate. Solar photovoltaic panels consist of many solar cells. Solar cells are composed of silicon, like semiconductors. They are built with a positive layer and a negative layer that together create an electric field, as in a battery. Photovoltaic solar panels generate DC electrical energy. With DC current, electrons run in the direction of the circuit. The electrons switch to the negative side of the battery, through the lamp and return to the positive side of the battery. What is a Solar Inverter Doing? The solar converter takes DC electricity from the solar network and uses it to generate alternating current. Inverters are like brain systems. With the addition of inverting AC to DC, they also provide ground fault protection and system statistics, including voltage and current in the AC and DC circuits, power generation and monitoring. First, sunlight hits the solar panel on the roof. Plates convert energy into the DC current flowing to the converter. The inverter converts the current from the direct current to the alternating current, which you can then use to power your home. It is very simple and clean, and it is becoming more and more efficient and more accessible. 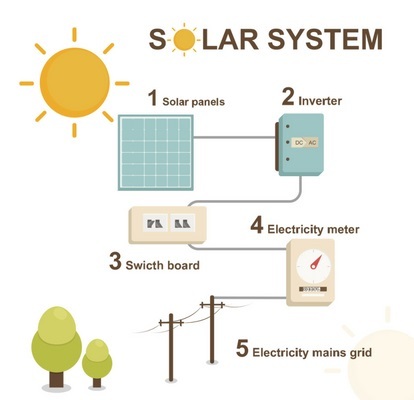 However, what happens if you are not at home using the electricity produced by your solar panels on every sunny day? And what occurs at night when your solar system does not generate energy in real time? Do not worry, you always benefit from a system called "net measurement". A typical PV system connected to the network over peak hours often produces more energy than one customer needs so that excess energy returns to the network for another use. The user gets a credit for the generated surplus of energy and can use this credit to draw from the conventional grid at night or in cloudy weather conditions. The network meter records energy sending in relation to the energy received from the grid.